If you are waiting to dispose of a tank, store them outside and upright with their caps on tight. Write empty on the container, and do not try to remove the valve. A propane tank is still pressurized and can explode or start a fire if it’s not entirely empty. Propane can also be damaging to your health if touched or inhaled, so any tank that is not empty must be disposed of as hazardous waste. 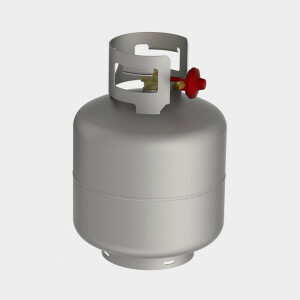 Empty propane tanks are less likely to injure people, because the tank is not pressurized with propane gas. You can dispose of propane tanks by returning them to AmeriGas. Find an AmeriGas office. Fees may apply.